Architecture has a real opportunity to embrace and protect the unique character of this region if it addresses the right questions. Site strategy, connection to place, site history, vernacular precedent and a willingness to consider program appropriateness are important issues that can be used to satisfy client needs and protect a delicate environment. Miner’s Refuge, intended as a weekend retreat in the beautiful but often harsh terrain of the Methow, was designed with these concerns in mind. The building is carefully sited at the base of the hillside tucked into the tree line to take advantage of and preserve the surrounding views. Its mass is dug into the topography, anchoring the structure to the site. The outdoors is pulled in through dramatic open views. 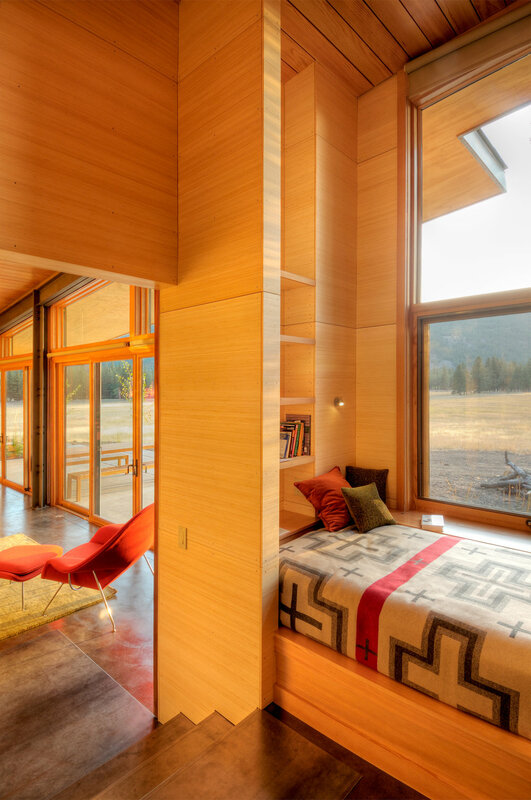 The protected patio and expansive vista of meadow and mountain are incorporated as major components of the design. Miner’s Refuge has taken up the challenge of drawing upon and adapting those lessons of industrial rural vernacular to accommodate the needs of a modern lifestyle. The building massing is mindful and reminiscent of the history of mining in the valley. Its long linear circulation corridor leads from the entry along the entire length of the house giving access to the living and sleeping spaces. Sustainability begins with building restraint. The owners of Miner’s Refuge came to the table with a smart and simple program that could satisfy their living needs in less than 1900 SF. The home, shared between two families, incorporates an open kitchen/living/dining area, two modest master suites and a small bunk room accommodating up to four guests. Renewable and environmentally responsible products were used where possible, the orientation and detailing of the building take solar gain into consideration and efficient mechanical systems combine to make Miners Refuge a project respectful of its environment. The visual, physical and conceptual connections to place were the driving force in the design and set this project apart. The beautiful landscape and charm of rural eastern Washington is what initially attracted the owners to this area. It is this character that the design for the Miner’s Refuge embraces and aims to protect.